How can Facebook fix its fake news problem? Facebook chief Mark Zuckerberg has promised the social network will take action over fake news appearing in its feeds, following complaints that the social network is deluged with fabricated posts. In a post on his personal profile, he said he was "cautious" not to make Facebook an "arbiter of truth" but said the company was testing new tools to flag hoax content. "Facebook's algorithm prioritises the popular, it doesn't know how to distinguish between real and not real," said Kate Bevan, a technology writer and broadcaster. "It doesn't care about the quality of a page - if something looks convincing and people are sharing it, that gets prioritised." And many articles do look legitimate. Once stripped down into a basic headline and photograph for Facebook's news feed, made-up articles look just as reputable as real ones. Articles can appear in your feed if shared by friends, but posts from pages your friends have "liked" also appear and Facebook's algorithm makes some of its own recommendations. Those recommendations include false headlines such as "Shocker: Donald Trump President-Elect Was Born In Pakistan!" and "Yoko Ono: I Had An Affair With Hillary Clinton". Fake news runs deeper than the news feed. 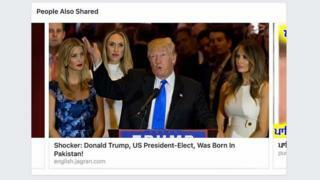 Facebook's algorithm has failed to prevent fabricated stories appearing in its "trending stories" section, while its live video tool has also been used for bogus broadcasts. "Social media is still pretty new, but we're really seeing the impact it's having," said Ms Bevan. "People trust authority, and these things masquerade as authoritative. It looks legitimate and people trust what they read. It clearly can have an impact on how people think." Mr Zuckerberg says only a "small amount" of content on Facebook is hoax news and puts the figure at less than 1% "across the whole system". Whether that figure includes misleading memes - such as made-up quotes from politicians, shared as a photo - is not clear. But he accepts people may see more fake material in their news feed "depending on which pages you personally follow and who your friends are". Perhaps the social network could take inspiration from Google News, which in October started attaching a "fact check" label to dubious stories and linking to trusted sites that debunked them - all achieved by algorithm. Facebook has already experimented with human editors for its trending stories section, although its human moderators were accused of favouring liberal-leaning stories over pro-Trump material. The site eventually sacked its human editors, instead relying solely on an algorithm to determine which stories were shown to be "trending". Mr Zuckerberg says the company has "launched work enabling our community to flag hoaxes and fake news", but warns that such tools could be abused by people wishing to discredit opposing political views. "Facebook has handed over responsibility to an algorithm, but it requires a lot of work," said Ms Bevan. "It could prioritise authoritative sources such as the Financial Times or Washington Post, but then you have the question of how to define authority. It would be a huge project for Facebook and hard for them to do it in a way that they won't be accused of bias." Some argue that Facebook's problem with fake news cannot be solved until the company is prepared to accept it is - in part - a modern day publisher of news. "Not sure you can keep up the denial here," Matt Navarra of The Next Web wrote on Mark Zuckerberg's post. "You need to accept the power and influence Facebook has and use independent editors to deal with the issues here." Mr Zuckerberg replied saying news and media were "not the primary things people do on Facebook". "I find it odd when people insist we call ourselves a news or media company... we are serious about building planes to beam internet access, but we don't call ourselves an aerospace company." But Ms Bevan suggested Facebook wanted to distance itself from the responsibilities that come with publishing news. "It's now one of the biggest publishers on the planet - and with that comes responsibility," she told the BBC. "News is something from which they're benefitting, so it's time to step up as a publisher. "But they don't like that, it's expensive and opens up a can of worms for them."